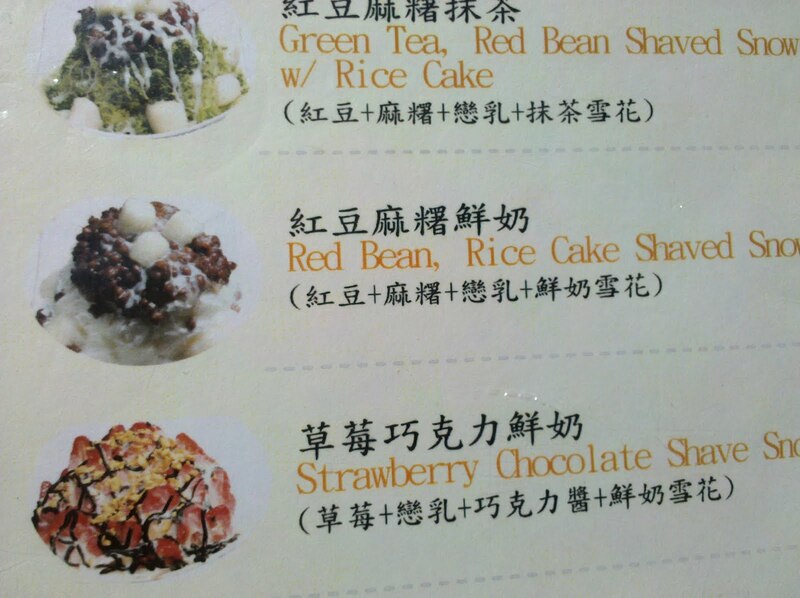 How I wish I could read Chinese! That's definitely on my list of things "to learn"! But have you seen the prices of Rosetta Stone?! Good grief! I'd have to sell a kidney just to pay for it! So until then...I'll just keep eating my way through L.A. and hopefully I'll have friends who can help me interpret along the way. 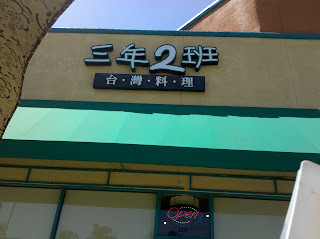 So this little Taiwanese restaurant is located in the 99 Ranch Market Plaza off of Nogales and Gale. And I've seen it many times when I go shopping for groceries. 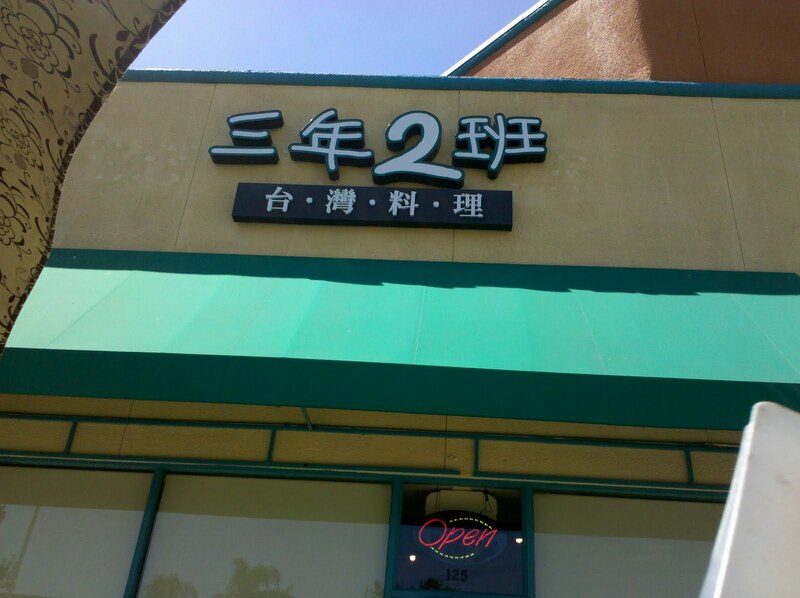 I'd see people outside, but since I don't read Chinese I had no idea what the name of the place was and what they offered. It wasn't until recently when my sister, god sister and a bunch of friends went down to get shave ice there, that is when I finally knew what it was. And thank the dear Lord that they went and my sister Robin fell in love with that shave ice because that is where we went the other day. 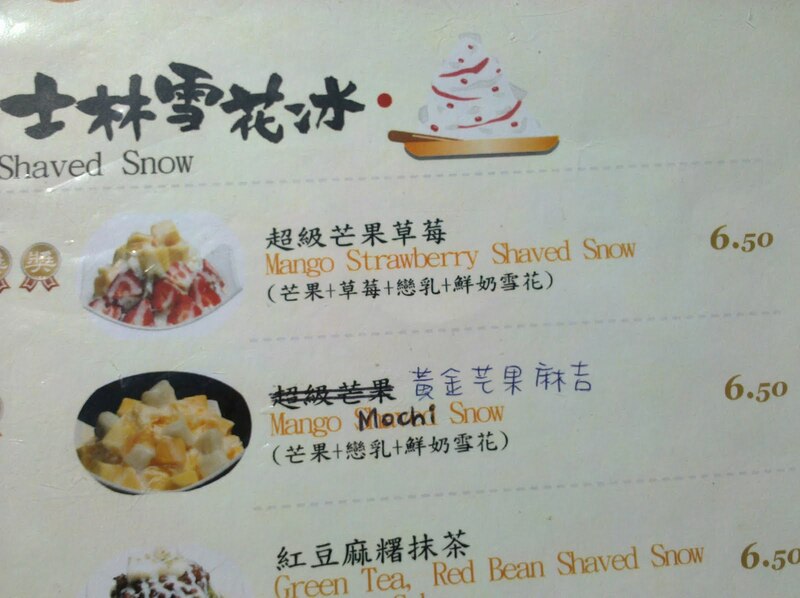 Anyhow, back to the shave ice. 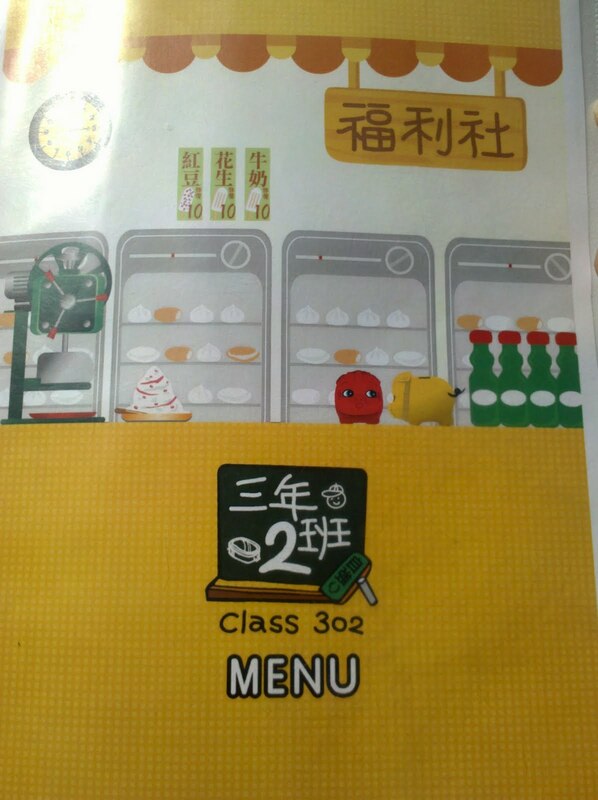 Here's the menu, and you can clearly see at the bottom Class 302. I sure wish it said it on the front of the restaurant! Ok, I have to take pause again and talk about the signage. Why can't it be in English?! Even just a mini little subtitle for all of use who don't read Chinese? Seriously! This is something that I've talked about before about going into a Chinese restaurant and ALL the super good food is NOT on the menu but written in Chinese on the wall! So not right! Because all this time, this great little place is right under my nose and I never went in because it was all in Chinese...I had no clue! This is something that I think many people might experience especially if they are of another culture...everything in a language you can't read or understand, it can be very intimidating to them. 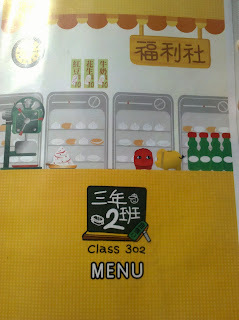 What's worse is that I AM Chinese and it makes me feel like I won't know what to get! That is not a good thing. I would like to change that somehow so whatever culture it is, it is much more inviting to everyone to want to go into a new place and experience it. 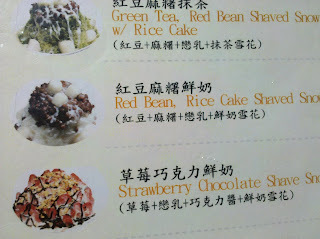 I didn't know what to expect when we ordered it...sure there's a picture, but still! I wasn't prepared for the amount of condensed milk that is just covering this entire mound of shaved snow, nor was i expecting how it looked...all the layers. So unique. 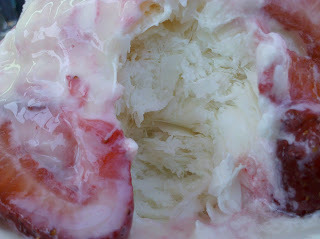 This was so light and airy, while maintaining this sweet, fruity flavor....it was "soft" and cold in my mouth. It was so delicious. I'm sitting here typing this out, remembering how it felt and tasted on my tongue and just wishing I could have another bowl of this! I felt like my throat was a cool cave and if I just breathed out...you could see the frost from my breath like in the winter time. 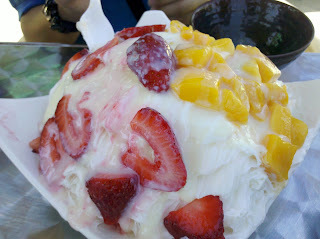 This was incredibly refreshing...and I have never experienced shave ice like this. Perhaps that's why the call it snow? It was very cool. This was definitely more on that dessert feeling side...because of all the chocolate. There were huge chunks of mochi in this...see those cream colored blobs that look like scallops? That's the mochi! I was actually expecting those little mochi balls you see at all the yogurt places, which I really like because they are the perfect size, kind of small, soft and easy to eat. But these mochi chunks were MASSIVE and very filling. Still good, just a tad bigger than I'd like. 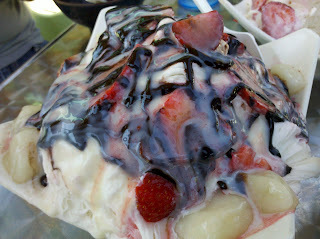 This gigantic, cold, goopy mess was SOOOO wonderful to eat on this extremely hot day! Crazy enough, I was stuffed after we were done!! I'm thinking...it's freaking ICE!! But still, I was so full, that I wasn't even hungry for dinner! But, I still made pan sushi and ate it since I figured I should eat something! haha (piggy) I think all the mochi and condensed milk just made me so full. I am still in awe of how they shaved the snow. I can't believe all those layers!! I want to see how they do this...because I have never seen or experienced anything like it and I really loved it! 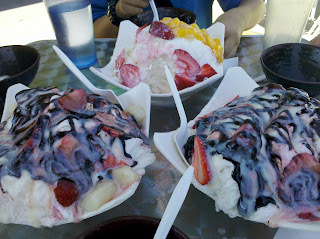 This is by far, THE best shave ice I've ever had. 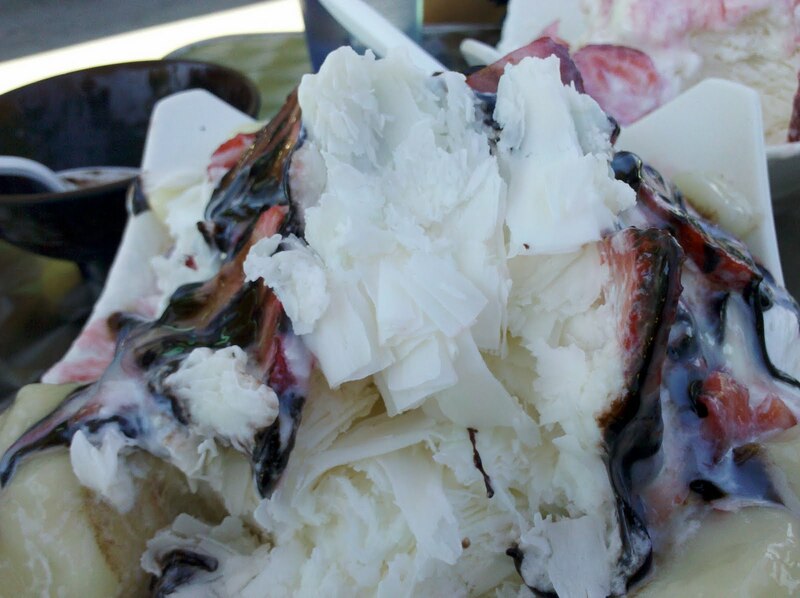 I enjoy shave ice every once in awhile, but seriously, you guys know how much I freaking LOVE ice cream, but this totally blew me away and it was such an incredible experience. I'd definitely go back! I just pulled up the layers so you guys can get a better look at it. *sigh*...anyhow, I heard they have great food too, so I'm looking forward to going back. Hopefully this time I'll be able to get a seat inside, and chow down on some of my favorite foods. If you're ever in Rowland Heights...and the weather is hot...come check this out! 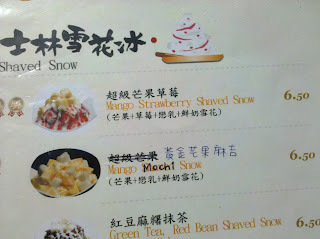 You HAVE to try their shaved snow!! !